Please give a warm welcome to author Mindy Friddle, who is guest posting today for So a Blonde Walks Into a Review as part of a Wow! Women On Writing tour. There's also a fun "Seedy Characters" giveaway in celebration of Mindy's latest book Secret Keepers, so be sure to read to the end! Are you a list maker? I am. I write and rewrite lists on stickie notes, deposit slips, notebooks, and--on rare occasions, when I'm feeling organized--I sign up for some new free software that promises to help you prioritize. It's the kind of task master system that sends you emails to remind you what to do everyday. Such ambition for compulsive organizing and prioritizing is--for me anyway--fleeting. Thank goodness. Now if I could get an email task list every morning that said: drink coffee and listen to the birds, write half the day, garden, take a long walk with the dog, have a drink and a leisurely home-cooked meal with your family, read for hours, repeat next day....well, I'd sign up for that one. So many of us are in the habit of just trying to get through something, to get it over with so the real fun begins, wishing away the minutes, hours, days, years. I've noticed too many of the "what's on your mind" statuses of my pals on Facebook say, "Can't wait until Friday." Usually that's on a Monday! But all this stuff...It never ends, you think. Paying bills, dentist appointments, taking the critter to the vet, the kids to practice, job responsibilities or looking for a job, haircuts, groceries, volunteering, buying birthday presents, and on and on. But dig up an old list in your glove compartment or some dusty drawer, a list you made a year ago, or five or more years ago, and you see all the tedious stuff that's passed, floated on down the river, that debris that seemed so important at the time. "Life is what happens to you while your busy making other plans." John Lennon said that. About a year ago, I decided to try to live more in the "now," and that meant to remember to give my full attention to whatever I am doing now. That's pretty much the opposite of what the busy world demands--multitasking, anyone?-- but I find doing one thing at a time makes me more productive, anyway. When I write, and when I'm outside, in the garden, it's easy for me to "lose myself"-- in a good way-- and escape the frantic tick-tock of time and deadlines, and access a real sense of peace. The zone-- some call it-- when your focus quiets the mind. Not so easy in a traffic jam or at a family reunion! But it helps to start small if you don't want to sweat the small stuff. And noticing just how often your mind chatters--planning, fretting, remembering, scheming-- is the first step. "To live is so startling it leaves little time for anything else." Emily Dickinson wrote, which always reminds me to pay attention to the smells, sights, and sounds around me right now, no matter where I am. I was in a crowded parking lot recently. Hot asphalt, grumpy people, jumbled shopping carts, car exhaust. I looked up at the lazy, beautiful clouds and there was a rainbow! No one else around me noticed. It was faint, but you could just see it if you looked up, and you were paying attention. Bio: Mindy Friddle's first novel, The Garden Angel (St. Martin’s Press/Picador) was selected for Barnes and Noble's Discover Great New Writers program in 2004, and was a National Public Radio (NPR) Morning Edition summer reading pick. 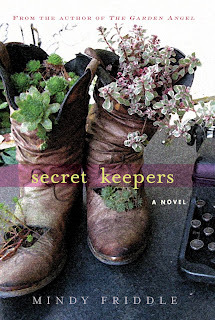 Secret Keepers, her second novel, was published by St. Martin's Press in May. She lives, writes, and gardens in Greenville, South Carolina where she directs the Writing Room, a community-based nonprofit program she founded in 2006. She often posts photographs of her garden on her blog Novel Thoughts: Musings on Reading, Writing & the Earth. Mindy is sponsoring a fun "Seedy Characters" giveaway for readers of So a Blonde Walks Into a Review! In addition to an autographed copy of Secret Keepers, one lucky reader will win packets of seeds hand-selected by Mindy. In keeping with the theme of Secret Keepers, which features a rescued garden and a range of flowers--both real and imagined, Mindy will send packets of her favorite flower seeds to the winner! To enter, simply leave a comment on this post letting me know what you loved most about Mindy's guest post. Be sure that there is an email address for you that I can find, or your entry will have to be disqualified. By entering, you automatically agree to all the rules and disclaimers listed here. Deadline to enter is 11:59 EST, Wednesday, July 1, 2009. Winner will be selected at random using Random.org. Good luck! What do you grow in your garden Mindy? I love how honest Mindy is - I am a list-keeper too and while i love to be organized, sometimes it drives me crazy. I am seriously considering taking up gardening now! Thanks for such a wonderful guest post and giveaway, Mindy! I wish I had your talent in the garden. Heading to your blog now to check out the pictures. I am also a gardner. I constantly jot down notes on certain plants that I want to try in my garden. I love that you took the time to look up and see the rainbow. If only we'd do that more often, take the time to observe the beauty around us. and also subscribe by google reader. I really liked the end when she was talking about the crowded parking lot and the grumpy people etc and saw a rainbow in the sky. Its all about the little things and taking notice. I know this is incredibly vague but I loved your writing style overall. It's quite unusual (but I can't say how because I don't have enough writing background to explain) and I love it! I love that she gets "lost" in her garden-!! I do the same -even though it is hard work..it is relaxing! Thanks Mindy!! Wonderful guest post, Mindy. I'm here by way of your blog, by way of Shelf Awareness. Have you ever read exactly what you needed at exactly the right time? That's how I feel right now. I've been too busy finishing all the things on my list to sit back and enjoy life or my garden. Thanks! I don't know how to Twitter, but I just finished subscribing to "Blonde" by email! The excerpt from "The Garden Angel". That's how I've been trying to live my life lately- in the now, aware of all the beautiful things around me. The book sounds great- and I love the cover! Great article. We all need to slow down and enjoy the scenery. I have a black thumb but this has motivated me to try to plant some flowers with my kids. I like how she finds beauty in the mundane. There is so much beauty around us that we fail to notice. Thanks so much for the giveaway! I liked how she talked about when she's writes and she's outside that it's for her to lose herself. I love when that happens to me. It's so true what she said - just don't sweat the small stuff, focus on what's important. My favorite part of your interview is the cover of the book. It is so pretty. Please include me in your giveaway. What I love the most about this post is the reminder to live each day in the present & give those endless lists a break! I like her idea of living in the "now." As a huge John Lennon fan, I adore that she quoted him. Great contest, great prize, make me a winner! What a great post. I try to live in the now, but it helps to be reminded. Especially when you have kids, it is easy to get caught up in what you have to do, get done, etc. I like that Mindy is a list keeper. I have to have a list for everything. My family sees me get a pad of paper they say oh no, mom is making another list! I enjoy how relatable Mindy is. Very down-to-earth. Boy can I relate to this! I remember the best advice I received about being a parent--never sacrifice what's vital and important to the things you "have" to do. Her reiteration of not sweating the small stuff. I need an email task list that has those things on it also -- including take time to breathe and slow down! :-) Great interview, and the book sounds wonderful! She's so down to earth and I loved what she said about listmaking and trying to be organized. I can totally relate. I like that Mindy is responding to the questions. Mindy has great phraseology in her post, so I bet her book is good! "...noticing just how often your mind chatters..." is so true.